For anyone doing much carving, gunstock work, period furniture, or the like will find numerous uses for wood rasps. For quickly shaping irregular shaped items like cabriole legs, ogee feet, Kentucky rifle stocks, or ball and claw feet, a good rasp can remove a lot of wood in a hurry. I have accumulated a number of them over the years, beginning with an old Nicholson rasp my father bought back in the early 1950’s for gunstock work. My only objection to the ones I have is that all are very coarse cut and hence are not very suitable for precision shaping. In my searches, I learned that there are such things as “hand stitched” rasps, made by hand, rather than having the teeth punched in symetrically by machine. Some reviewers advocated the hand stitched rasps as being more smooth in cut because of the slightly irregular pattern. I also learned that there are hand stitched rasps made in Austrie, Pakistan, and France. (Auriou and Liongier in France) Auriou seems to be the more readily offered here in the States, but I settled on the Liongier, ordered directly from France. Since I already had a selection of 3-4 grain rasps, I chose a #7 in a 10 inch length, and a #11 in an 8” length to offer some choices across the range. Liogier also offers a “Sapphire” grade rasp, which claims to offer 4 times the life of their normal steel rasp. Liogier appears to be the only maker to offer this grade. The rasps arrived, along with a brass cleaning brush in about three weeks (they are apparently made up to order) by air, for only $14 FedEx shipping. They arrive well packaged in hard plastic sleeves that can be used to keep them from harm in the drawer. For many folks, the big question will be whether they are indeed worth the premium price. All hand stitched rasps are pricy, and these are no exception. The two sapphire grade rasps and the brass cleaning brush came to around $240 including shipping. For anyone doing precise wood shaping work, and valuing premium hand-made tools, the cost is probably not a problem. I think they are good value, and recommend them. I’ll probably even cough up for some of their rifflers. For those who are put off by the price, then they are probably not the best choice. Hope this is helpful to anyone considering buying a premium rasp. After all, a good tool, that does just what it’s supposed to do, is a genuine pleasure to use. Always wanted some of these. Do you think the sapphire coating hinders the cut at all? How are they at getting clogged? What kind of finish do you get with the #11 grain? I do not notice that the sapphire coating (I presume it is a coating, or plating) hinders the cut at all. I don’t know just what the treatment is, but they claim it is incredibly HARD, hence the anticipated longer wear. They don’t seem to clog any more than a regular rasp, at least on mahogany. The finish with the #11 is something maybe akin to a 60 grit sandpaper. Relatively easy to clean up. Hope this helps answer your questions. I have used Auriou in France for many years. These raps are expensive but they are very durable and they do a wonderful work. The name is Lioger not Liongier. There is video to show you how these raps are made. Not only he fixes them but he makes them appears as special features. Watch this video, you will be impressed. I have the Auriou rasps and they are wonderful to work with (and it seems very similar to the ones you review: hand cut in France, expensive, worth it especially considering the work it takes to make one). The real surprise is how smooth the finish is for how rough the rasp is. Quite the opposite to the way sandpaper seems to work. I discovered Noel Liogiers rasps this year, when taking part in a Workshop course. His rasps are amazing, and I have since acquired several. They make quick work of nearly any wood and surface and don’t clog near as quickly as my industrial rasps. I have no experience with Auriou, but I suspect that they compare well. Another brand available here in Europe is Milani, an italian maker. Not quite as good, but decent quality for a very good price. No, premium rasps aren’t cheap, but once you’ve used one you will be wanting to use it more. It was their performance that convinced me. Also, you don’t need a wide range for most uses. A solid 9 for medium to coarse work will get you 80% of the way (and leave a decent surface), and an 11 or 13 can top it off. Do you need the more pricy sapphire versions? 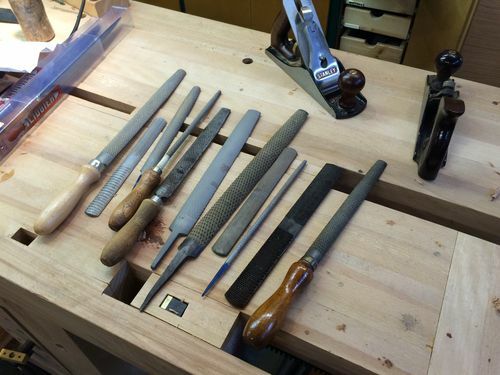 If you are a pro and earn your living with handtools they possibly make sense. I believe though that the regular ones will probably last me for most of my woodworking life. Thanks for writing the review Roger. You do a fine job presenting unbiased information. I have used a 9 grain and 13 grain quite a bit for the past 2 years. I would say they are my favorite tools by far. They are very responsive to your needs – they can be aggressive or gentle, and I never had to brush them out while working with walnut. I went with the sapphire finish. I am quite thrifty (cheap), but for the effort and skill needed to make these rasps, they are a real bargain. They are a joy to use. I wish I could try them out somewhere… maybe a lie-nielsen event for the auriou equivalents? I would love to own some but have no idea what sizes and grains to buy. I suppose it depends on the work, but I do everything from large curve smoothing to small handle making. Mostly use half-round files for this now, but they’re not the best. Allen, contact Noel Lioger, her will help you to select the file you need. I have a trio, and they were a revelation. I will recommend them without reservation. Logier and Auriou are the bees knees. Thanks for the write up Roger, only have the course cut and didnt realize there was a choice. I have the #9 and #13 Aurious that LV sells and I love them. So much nicer than folding sandpaper around blocks or dowels. I think they also create less airborne dust than sandpaper. For initial shaping, LV sells a cheaper hand stitched rasp (that I’d guess is maybe a #5 or so) and it also works very well for that job. I might get one of the Liogier specialty rasps some day.